Sri City, August 15, 2018:- At Sri City the 72nd Independence Day was celebrated with zeal and fervour. 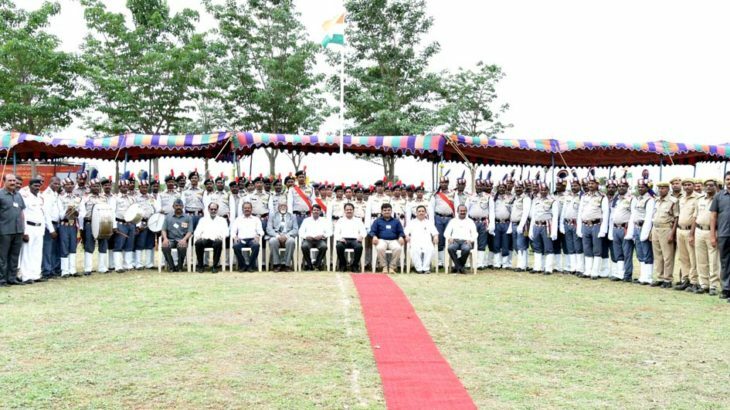 In the function held at the lawns of Business Centre Mr. R. Muthuraj, ITS, Development Commissioner, Sri City SEZ, unfurled the national flag and took the salute in an impressive parade held by the contingents of Sri City Security force. Mr. Ramesh Kumar, Vice President (Customer Relations), Sri City received the chief guest and extended a warm welcome to all the guests. Mrs. Vimalakumari, Dy. SP, Sri City, Mr. Ramesh, Officer Incharge, Security & Vigilance, and a host of officials from the industrial units and Sri City took part in the event. Cash awards were presented to five security guards in recognition of their meritorious services. In IIT Prof. Kannabiran, Director hoisted the national flag. Later, students took part in the blood donation camp, which was organised jointly by the NSS Unit of IIIT and Sri City Foundation in memory of the sacrifices of the freedom fighters. More than sixty students donated blood. The maternity hospital, Tirupati conducted the camp. The Director and the faculty members and Sri City Foundation officials were present at the camp. Independence Day was celebrated in a befitting manner at the Development Commissioner’s Office of Sri City. Mr. R. Muthuraj hoisted the National flagand addressed the staff. Besides Chinmaya Vidyalaya, seventeen government schools and fourteen anganwadis in Sri City villages celebrated the Independence Day with active participation of students and teachers. Following the flag hoisting, prizes were given away to the winners of various competitions. Sri City Foundation assisted the schools in organizing the celebrations. Cookies were distributed to all the students.